My aunt, Nancy, has one of the sweetest dogs on earth but he does like to chew things. 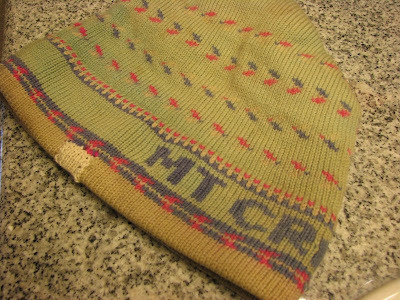 My future-cousin-in-law was visiting for Christmas and he left his hat, which apparently has sentimental value as well, too low. Ozzy was delighted with the new chew toy. 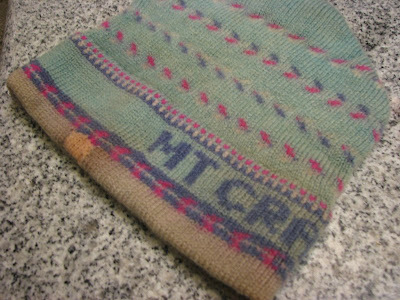 The hat was rescued and Nancy sent it to me to see if there was anything that could be done. The problem was a small ragged hole near the brim. I undid all of the edges back to an even point where there was enough length left to tie the ends off and picked up stitches at the top and bottom. The bottom stitches were, of course, live. Here it is after the ends were tucked inside. 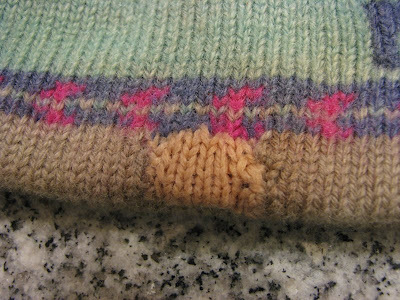 The hole was seven stitches by ten rows. The closest yarn I had was off white Cotton Fleece by Brown Sheep. 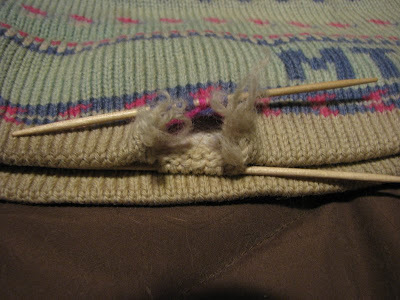 I separated out two plies to get the right weight and knit a flap up from the live stitches. 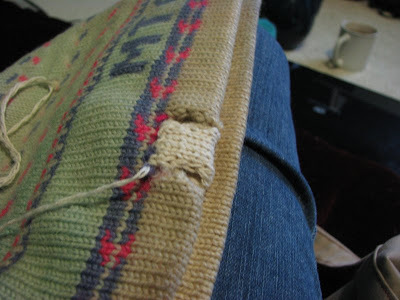 Using the Kitchener stitch (what I sometimes consider the most useful thing I've ever learned), I hooked the live stitches to the top of the hole. 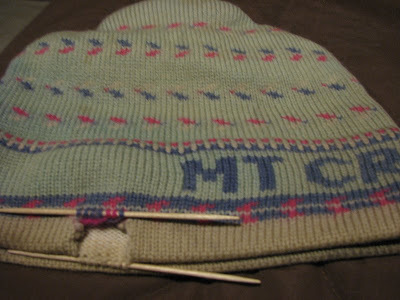 Here it is after the edges were sewn but before the hat was washed. I decided to try tea dying to make the mending a little less obvious. I wish I'd gotten the pre- and post-op photos shot in the same light. I plastered the new patch with tea grounds two times for about an hour each time. The whole hat was soaked in color safe bleach solution for a couple of hours before the dye attempt. Dogs do not preserve cleanliness in hats. It needed a good wash but I'd asked Nancy to not clean it before it was sent. I hated to run the risk of more damage. I wish I'd had a better color match possible but I'm pretty proud of how the patch turned out - it's neat, durable, and serviceable. The color thing bugs the heck out of me but the dying did seem to improve it. I hope it will serve. It's better than just having to throw it out.